How can the nation deal with soaring cost of college? President Obama is focusing on something that is increasingly the source of high anxiety for middle class families -- the cost of higher education. Matt Taibbi, contributing editor for Rolling Stone Magazine, Anya Kamenetz, reporter and author of Generation Debt, and Robert Kelchen, assistant professor of higher education at Seton Hall University and a contributor to The Washington Monthly, join Chris Hayes to talk about what can be done. f>>> good evening from new york. i'm chris hayes . tonight on "all in," as the struggle for low-wage employees continues, fast food worker strikes demanding higher wages spread across the country. my guess tonight is the former ceo of mcdonald's, who says raising the minimum wage will kill jobs. i disagree, and that's coming up. >>> also tonight, this weekend we commemorate the 50th anniversary on the civil rights march on washington . tonight, a look at a half century of racial progress. how far we have come and how far we have yet to go. >>> but we begin tonight with president obama , who just a few hours ago completed the last of four speeches in two days about something that is increasing the source of high anxiety for middle class families, the cost of higher education . >> over the last three decades, the cost of higher education has gone up 260% at a time when family incomes have gone up about 16%. >> the president may have been slightly understating just how bad it is. while the cost of a private non-profit four-year school has risen 267% over the past 30 years, the cost of a public four-year school has risen 375%, according to the college board advocacy center. in the past nine years, the average student loan has gone up 91%, from more than $10,000 to more than $20,000. overall, outstanding student debt now stands at a whopping $1.2 trillion. compare that to the overall outstanding debt for homes or credit cards or auto loans. it is higher than any of those other big-ticket items, and that is a bit frightening. with that skyrocketing debt, it is important to know, is the symptom. 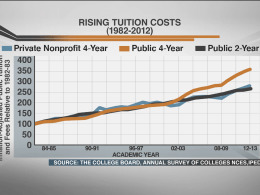 the escalating cost of tuition is the cause. and the president went after that today, head-on. >> we want to start rating colleges, based on how well they're doing in providing good value and opportunity for the students. i mean, right now you've got a bunch of ranking systems, some of them commercial, and when you look at what's being rated, it's typically how selective the schools are, how few students they take in, and how expensive they are, and what are their facilities like. and what we want to do is to start looking at factors like, how much debt do students leave with? and do they actually graduate? >> part of the president's plan is to create a new college rating system by 2015 that would emphasize affordability and student performance, and also, this is really key, tie federal aid to that ratings system. this would be, if it came to fruition, an absolutely revolutionary change to the entire broken higher education marketplace, which runs, we should note, on a whole lot of federal dollars. joining me now is matt taibbi , contributing editor if " rolling stone " magazine. matt, you just had a great piece in " rolling stone " about the inflation in college costs. i was at a family event with my uncle a few weeks ago, celebrating the graduation from eighth grade of one of my cousins. his older cousin is a student at rutgers, all -- in cost, $26,000 a year. >> new jersey has a median income around $67,000 for a family of four. but even with that, i -- literally, my jaw hit the floor . i was like, how you doing this? how are you going to do number two? and this is the problem facing everyone across the country. >> it's -- i mean, i heard so many horror stories in preparation for this piece. and i actually, i have my own relatives who have their own problems with student debt pip mean win talked to people whose parents paid their entire undergraduate bills, paid tuition, paid all their expenses, and just the loans that they paid for their graduate degrees are leaving women th them with $250,000 in debt, the finance charges alone are tens of thousands of dollars. and it's crippling. people end up not touching the principle on this until they're in their late 30s or early 40s and sometimes they pay it until they die. >> so we had a fight over student loans this year and it was a fight about the interest rates and how the interest rates were going to be calculated. the point the president has been making in these speeches, the point that a lot of people i respect have been making is the loan problem is the symptom. the cause is the rise in tuition. why is this thing going up so fast and why can't we stop it from going up? >> well, i think one thing that a lot of people that i talked to talked about was the sort of, i mean, it's similar to the housing crisis in that both problems are created by kind of a serial overavailability of credit. there's this bottomless well of government money that just keeps flowing out into the economy. and every time they raise lending limits or every time they send more money out there, these private for-profit colleges jack up their costs, literally almost exactly to the dollar, to match the amount of new money that's going out. >> so here's the deal. it's like, well, it's $10,000 a year to go to this school, and i'll take out a loan of $10,000. and then they jack up tuition, and then there's pressure , so that the loan can be $12,000, and that cycle keeps repeating itself. >> and the flip side is kids more than ever feel that they have to go to college to get even the most menial kind of job. "the new york times" did this study involving a law firm in atlanta, where even the clerks and the runners in the law firm had to have college degrees, just to work there. if you want any kind of job, you've got to do this and you've got to ride this debt dragon, and there's no way out of it. and so, even kids who are -- who have their eyes wide open are faced with this incredibly difficult choice, very early in life. >> i want to bring in the conversation, author of the book " generation debt " and "diyu." and robert kelson, contributor to the washington monthly . robert helped devise washington monthly 's best bang for the buck monthly rating, which started as a rebuke to the " u.s. news and world report " rankings. we asked someone from " u.s. news and world report " to join us, but they did not have an available representative tonight, which is a shame. what methodology did you use for your ratings system, and could it be implemented in a federal way to actually create some kind of accountability here? >> so the measures that have been released so far are what we call a bang for the buck list. and those are colleges which graduate at least half their students, do better than expected, given the characteristics of their students, have at least one in five students on pell grants , which doesn't sound like much, but that knocks out many elite schools. >> and also have student loan default rates of 10% or 7% or lower. >> so i want to show a comparison of these two ranking lists. this is fascinating to me. the u.s. news, your top five is basically what you would imagine. harvard university , princeton university , yale university , column b columbia university , and the university of chicago . your loist is california state university fullerton and the university of florida . and the difference here is the difference between prestige on one hand, and actually value added of, what are the inputs. what are students coming in with and what are they getting? is that more or less the difference? >> that's the goal, yes. and to highlight colleges that are doing a good job with their students and at a reasonable price. the u.s. news does reward colleges for spending more money. those measures do have a great use. they're great at measuring prestige, but they're not quite as useful for helping students to get through and potentially through college . >> perversely, the cost of tuition ends up becoming a mechanism signaling prestige. so it's almost a perverse market, whereas, as opposed to trying to get lower cost, if you cut costs, then you don't look like you're really serious, important college , whereas if you jack up -- you do, right? >> well, we're moving, hopefully, away from a status quo , where colleges have all been on the same status ladder. they've all been competing for the top to be harvard . and there hasn't been room for a real discussion about exactly what you're talking about, value-added. because the value of getting into harvard is that you got into harvard , and on 5% of people get to do that. >> it's not what you learn there, it's the fact that you have this, you are an elite. >> once you get accepted, you're like mark zuckerberg , you can leave immediately and you'll be fine. >> or go on and on. but the point is, we need to have a conversation about college for everyone, because we created this system of mass higher education in the united states . everyone is supposed to get a degree. now, how are they supposed to afford that? >> well, one of the things that is happening here, and i'm curious to hear all of you weighing in on this, is how much of this is about tuition increases at public university ? when there's two conversations? people tend to talk about like college and you get this very elite conversation among people that are looking to send their kids to harvard university of chicago. but a very, very, very small slice of americans are going to college there. the bulk of americans are either going to community colleges or if they're going to four-year schools, they're going to public institutions. and public institutions have seen their budgets cut and their tuitions go up, isn't that right? >> this is one of the huge problems we have with federally backed student debt, is because the states have all their own economic problems now. one of the things they're almost all doing is slashing their subsidies for higher education , which is causing the colleges to go elsewhere, in search of funding. and what they're predominantly doing is asking kids to take up more student loans from the federal government , which is creating all this upward pressure on federal budget . >> and that's the highest it's ever been. >> it's going up from a quarter, you know, a couple of decades ago. >> that's important. a couple of decades ago, it was a quarter of tuition, now it's half. they are increasing -- the 25% difference is what the tax state dollars you'd to support. >> and a lot of these flagships are getting so much money from research grants as well as tuition, in important ways, they're not public anymore at all. >> so here's my question. is one of the core ideas here behind the president's plan is to not only just create this alternate ranking system , but, actually, create financial accountability, right? so federal dollars are only going to flow to those schools that are demonstrating that they're doing something in a value-added way. is that workable? will that solve the problem? >> i'm not sure if it would solve the problem. i think what we're more likely to see is college -- or the government going after colleges which do really poorly. it may not knock out the worst half of schools, but it could, potentially, knock out, say, the worst 10% of schools, where a few students graduate with lots of debt. >> i think there's another important caveat here, which is the president's plan, there's almost no specifics at all about it right now. >> right, we won't see anything until 2015 , and the plan says they'll implement it by 2018 , which is two years after this president leaves off. so, you know, for all this criticism of " u.s. news and world report ," we know what their methodology is. we don't know what his is yet. >> i think we can see that, you know, what he's trying to do is push ahead a conversation that started in the for-profit world, which was gainful employment rules, which is you're going to withhold student aid from colleges that have so many other students defaulting, that it's a joke. >> because, basically, just so folks are aware, a lot of for-profit schools started to look suspiciously like, essentially, scams on the federal government . which was enroll people, get their federal student loans , pay for tuition, and then just run them through some courses, kick them out, and they don't have an education, they don't have a job, they can't pay back the loans, but you got the money for the tuition. >> they have 10 to 30% of the students and 40% of the defaults. >> these are private, for-profit. >> some of those for-profit colleges are barred from accepting more than 90% of their tuition from federally backed student loans , and for some of them, even that is not enough. they're actually seeking more. they're taking an enormous percentage of their tuition from federally backed student loans , which is hugely problematic. >> and there's a big part of this, would actually be taxing and recommitting tax dollars at the state level, to better-fund public universities , to bring down tuition, right? that would be a big part of this. like having the tough conversation at the state level, running on a campaign, at the state level, that says, yes, we're going to raise tax revenue to fund this thing, which we think is really important. >> i don't know if you caught the report that came out a couple of weeks ago that said that the average grant that's received by stundents coming from families earning more than $100,000 a year is more than what the poorest kids are getting. and that's simple. the poor kids go to poorly resourced schools. they're more likely to start out at community colleges that have less money. so one thing that states could do, they could equalize funding. >> matt taibbi and robert kelton of the washington monthly , thank you all for your time. >>> okay, we have some interesting guests coming up tonight. one of them co-wrote the song " puff the magic dragon ." another was the ceo of the multi-billion dollar fast food corporation called mcdonald's. the one that believes raising the minimum wage is a terrible idea will be here in a moment. guess which one.